I recently had the unfortunate luck of having my ipod die on me. I knew the day would be coming soon when the battery would only stay charged for a short time. The ipod mini had served me well for quite a few years actually. I rewarded myself with a new one last weekend. I love the sleek design and nice shiny silver on the backside. I have moved up into the world of the color screen and cool album cover flow. No more monochrome for me :)! The best thing about getting a new ipod is having it completely empty. I have decided to start from scratch and not import my old playlists or albums. I had capped out my memory capacity on the old ipod and now with the new one, I have some room to spare. I can really have fun pulling out all our old cds and go crazy downloading them. As I was organizing my stacks of albums and deciding what to put on my playlists, I came upon two of my all time favorites, The Eurythmics and Annie Lennox. The Eurythmics was a British Pop Rock band of the 80’s with Annie Lennox as the lead singer. Later in 1992, Lennox began a very successful solo career. She has a fantastic, powerful voice that is very easy to sing along to. A flood of memories from college came rushing back to me as I looked through the stack of albums. My roomate,Gina, and I would put on The Eurythmics and crank the stereo up as loud as the volume would allow. Our favorite songs were I Need a Man and Missionary Man. It was our pre-festivities warm up for an evening out on the town. Gina and I would be bellowing out the tunes as we got ready for a night of fun. That was over twenty years ago, hard to believe how time flies; I might not be bellowing out the tunes before a night out on the town(I got the man) but I do love to blast the music as I clean, take walks or just hang out at home. Ultimate Collection : This remastered greatest hits package was released in November of 2005. My top two songs: Sisters are Doin’ it For Themselves and Who’s That Girl. Revenge: Released in 1986, the band changed their sound to be more of a pop rock genre. The album went Gold in the U.S. My top two songs: Missionary Man and Let’s Go. Sweet Dreams(are made of this) : The album was the Eurythmics’ big break through with the popular title track, Sweet Dreams. Lennox quickly became an eclectic pop icon with her orange crew cut gracing the cover of Rolling Stone Magazine. My top 2 songs: Sweet Dreams and This is the House. This Post is Authored by Audra, whose new Ipod is locked and loaded with new tunes! Oh No! Not More Snow! More snow? More snow means more time in the house with the family. Snow days are always fun and special. We love to stay snuggled up in our cozy houses, curled up on the couch with a good book or movie. You make special meals and spend hours in the kitchen conjuring up warm surprises for your delighted family. It is picture perfect: warm house, happy family and the dog lying by the fire…..
Winter is a perfect time for experiments in the kitchen. I have tried two new recipes during the most recent weekend snowstorms. I whipped up King Arthur Flour’s Crumb Coffee Cake (page 98)from The King Arthur Flour Baker’s Companion. This coffee cake was most delicious and devoured up by everyone. I would say a definite win in my house. The next recipe was picked out by my daughter. I had brought home Rachel Ray’s Look + Cook and she had flagged the Chicken Ragu recipe (page 28)as one that she would like to try. Off to the kitchen I went, excited with my new recipe in hand. I was so proud of my new concoction and it was delectable. The Fountainhead by Ayn Rand. The novel is about an uncompromising architect who refuses to change his designs, and when he discovers the plans for one of his buildings has been altered, he destroys the structure and tries to defend his actions. Next in pile is the Hunger Games by Suzanne Collins. This futuristic story delivers equal parts suspense, philosophy, adventure and romance. The games are harsh and cruel as each district in the state has to send one boy and one girl between the ages of twelve and eighteen to participate in the annual Hunger Games, a fight to the death broadcasted on live television. The Hunger Games is heart wrenching as well as action packed. The young adult trilogy consists of Hunger Games, Catching Fire and Mockingjay. For my own reading, I welcomed two favorite authors. They never disappoint me. Curling up on the couch and reading these books were as comfortable as my old sweats and my Red Sox blanket. I read Bad Blood by John Sandford, a Virgil Flowers novel. Flowers digs up the dirt on a cultist church, romances the town sheriff and has an old fashioned shoot’em up as he stops the villains. I then welcomed Deception by Jonathan Kellerman, another adventure with the mild mannered psychologist Alex Delaware and the nonconformist LA detective Milo Sturgis. This mystery is less about action and more brain power to solve the puzzle. Movies are also a favorite past time during our winter evenings. We enjoyed watching Winter’s Bone; a movie about a seventeen-year-old girl who sets out to find her father who put their house up for his bail bond and then disappeared. The father was arrested for cooking crack. If she fails to find him, she and her family will be homeless. Challenging her family’s code of silence and risking her life, she weeds her way through the lies and threats offered up by her relatives and begins to discover the truth. The movie marathon continues as we then watched The Town. The film is about a longtime thief who tries to balance his romance with a bank manager who is connected to one of his earlier bank heists.The movie is set in Boston and having Fenway as part of the film won some points in my house. While they were watching The Town, I had the pleasure of watching one of my favorite Doris Day movies, With Six You Get an Eggroll . She plays a widow with three sons who elopes with a widower with a daughter. Together, they must deal with the antics of their children. I am very thankful that the eight day forecast does not have any snow in it! Maybe we can all thaw out a little. This post is authored by Audra, who is ready for spring and yes, Spring Training. 1.Sigh No More by Mumford and Sons: The album is by far my favorite check out of 2010! The band consists of four young men from West London. Their songs are an eclectic mix between bluegrass, folk and old world charm. They really make you feel the words and their message. The website sums it up beautifully ” Feel the fire in your belly and the romance in your heart as you listen, let your voice break into rapture – and you too, sigh no more”. Check this album out and you won’t be disappointed! 2. Daughters of Witching Hill by Mary Sharratt: Based on the infamous 1612 Lancashire witch trials, Sharratt’s latest novel portrays the religious turmoil and hard life of 17th-century rural England. What makes this story fabulous are two main characters: Bess Southerns and her feisty granddaughter Alizon Device. Bess is a healing woman, able to cure animals and people with herbal folk magic. She strives to do only good, but when she teaches her dear friend the witchcraft, she releases a curse of revenge and evil. Years later, Alizon comes into the power herself but denies it, and this leads to tragedy. The story has you rooting for Bess and cringing at the treatment of the women and their families in the prisons. A great read but not for the faint-hearted! I loved this book. 3. Compromising Positions by Susan Isaacs: Long Island housewife, Judith Singer, is incredibly bored with her marriage and her life. So when her dentist is murdered and the suspect is her neighbor, Judith is only too happy to stick her nose into the investigation. Judith delves deeper into the murder and deeper into the throngs of an affair she has with the lead police investigator. This book was recommended by a patron and I am glad he did. The read was pure entertainment and a very interesting look into the lives of the 70’s housewives! Did anyone stay faithful? 5. Girl with the Dragon Tattoo by Stieg Larsson: “An international publishing sensation, Stieg Larsson’s The Girl with the Dragon Tattoo combines murder mystery, family saga, love story, and financial intrigue into one satisfying complex and entertainingly atmospheric novel”. (From the Trade Paperback edition). I really enjoyed the mystery and thrill of this first book in Stieg’s trilogy, however I did not enjoy the 2nd book, Girl Who Played with Fire, as much. I am on the waiting list for last book, Girl Who Kicked the Hornet’s Nest . I hear this is the best one yet. I look forward to reading it. 6. Minds Eye by Hakan Nesser: This is the first novel in the Inspector Van Veeteren series. The series is set in Sweden. Chief Inspector Van Veeteren is a grumpy investigator that has a rather unsettled personal life. Van Veeteren is philosophical, with a dry wit that makes this an enjoyable read. In this mystery, Chief Inspector Van Veeteren knows that murder cases are never as clear as they appear: Janek Mitter woke one morning with a brutal hangover and discovered his wife of three months dead in the bathtub. Without a clear alibi, Mitter is found guilty of a drunken crime of passion and sentenced to a mental institution. But questions arise of his guilt when Mitter also becomes a murder victim. Now the chief inspector launches an investigation into the two murders. But it may only be through a mysterious letter that Mitter wrote shortly before his death that will finally allow Van Veeteren to find the real killer. If you like a mystery and are a fan of the hunt- Nesser is for you. 7. The Girl Who Chased the Moon by Sarah Addison Allen: Sarah Addison Allen invites you to a quirky little Southern town. Two very different women, Julia and Emily, discover how to find their place in the world no matter how out of place they feel. They discover that mysteries aren’t solved in Mullaby; they’re a way of life. Allen weaves her fantasy elements into this story through magical wallpaper that changes to suit your mood or lights that skip across the yard at midnight and mystical cakes. Julia bakes cakes to satisfy the town’s sweet tooth but she also bakes in the hope of rekindling the love she fears might be lost forever. Can a cake really bring back a lost love? Is there really a ghost dancing in Emily’s moonlight backyard? Allen writes nice stories that are not too “sweet”. This book is great entertainment. 8. Ruby Blue by Roisin Murphy: Funky, jazzy and electric are words that I would use to describe this album. The songs are a mix of dance rhythms, organic drums and funky piano tunes. It has been described as having a “psychedelic quirky edge and is an entertaining, slightly bizarre solo debut. Lots of fun”(amazon). Good album to listen to while I do my yard and house work. 9. Major Pettigrew’s Last Stand by Helen Simonson: In the small village of Edgecombe St. Mary in the English countryside lives Major Ernest Pettigrew (retired), the unlikely hero of Helen Simonson’s wondrous debut. The Major leads a quiet life filled with the proper things that Englishmen have lived by for years: honor, duty, and a of course, a good cup of tea. The Major and a Pakistani shopkeeper, Mrs. Ali are drawn together by their shared love of literature and the loss of their spouses. They soon discover they have romantic feelings for each other. Can their relationship survive the differences of their culture and tradition? Major Pettigrew is a wonderful story. A great read for a cold winter’s night! Oh! The Holiday Cheer….. BAH! It is that time of year again, the crazy holiday season. The time when it seems every one is stressed, tired and very irritable. Whether it be on the road, standing in those long lines at the check out or just plain dealing with the regular folk in your life, it can be a trying time. Why is that when the Holidays stroll along your family can turn into these uptight crazy people? It is almost impossible to please everyone on your list. How can you find your inner peace during this hectic time? I am trying desperately to stay focused on the good, to stay calm and just go with the flow. I admit, I am struggling a lot with finding my inner “happy place”. Talk to the Hand: The Utter Bloody Rudeness of the World Today, or Six Good Reasons to Stay Home and Bolt the Door by Lynne Truss is an absolutely hysterical book. Truss delves into the death of civil discourse, the loss of customer service, the refusal to live by any rules but one’s own, the all to common use of profanity, the dismissal of criticism, and the lack of responsibility. Each examination is not only an opportunity to rant but a thoughtful and intelligent effort to understand the obnoxious behavior. Miss Manner’s Guide to Domestic Tranquility: The Authoritative Manual For Every Civilized Household, However Harried by Judith Martin. Miss Manners reminds the confused of basic civilized manners: no nosiness, no exploitation of social events for business purposes, no taking note of others’ rudeness, and taking an interest, whether faked or genuine, in one’s guests. Half-judge, half-humorist, Martin is very entertaining. 10 Secrets for Success and Inner Peace by Dr. Wayne Dyer PH.D. Dyer suggests having a mind that is open and attached to nothing, treating yourself as if you already are what you’d like to be. You apply the wisdom of avoiding all thoughts that weaken you. The book is complimented by peaceful pastel-colored watercolors. Don’t Sweat the Small Stuff….and it’s all small stuff by Richard Carlson. Carlson provides common-sense advice for living a less hectic and more meaningful life. His essential message is that we get caught up in “the small stuff,” and never get around to doing what makes us or those around us happy. He advises readers to engage in such small kinds acts such as paying someone a compliment daily or writing a letter to a friend. Carlson urges small daily changes to bring about a more peaceful self. 8 Minute Meditation: Quiet your Mind. Change Your Life by Victor Davich. This book offers a simple, easy program to help beginners experience reduced stress and increased focus in only eight minutes a day. Designed by meditation expert and bestselling author Victor Davich, this program teaches the basic principles of meditation. An Open Heart: Practicing Compassion in Everyday Life by the Dalai Lama, edited by Nicholas Vreeland. Dalai Lama continues to spread his message of compassion beyond the borders of Buddhism. The Dalai Lama teaches us that mediation is merley the process where we gain control over the mind and guide it in a more virtuous direction. Meditation is used also as a technique used to diminish the force of old thought habits and develope new postive ones. This book is a treasury of teachings that point clearly to a better way to live. And finally if you just cannot find that inner peace– and all else fails– turn to Chocolate From Simple Cookies to Extravagant Showstoppers by Nick Malgieri. Triple Chocolate Pudding on page 202 will do the trick for me. How about you? I always said it would be my husband’s responsibility to teach our children how to drive. However, it initially did not turn out this way. I have just finished my second on- road driving lesson with our daughter.For our first lesson, I climbed into the car and began a quiet conversation with myself. I was not going to yell and I was not going to let her see me be nervous.I think I succeeded. But, half way through our second lesson, I looked down and realized that I had formed a death grip on my door handle and my entire body was as rigid as a 2 by 4. Sitting in the passenger seat was quite a different perspective as you teach your child to drive. On one hand you glance over to your left, you still see your little baby and on the right side of your view,you envision your car hitting every mailbox on the side of the road as she overcompensated for the oncoming car. At the close of the second lesson, we turned into the safety of our driveway. She lightly hopped out of the car, not a care in the world. She was so happy and gained more confidence with every trip behind the wheel. Me? I cannot move, frozen– I wanted to curl up in a fetal position and take a nice long nap. My legs felt like jelly and I needed get my heart-rate back to normal or at least back into my chest! We survived two lessons; the third lesson was missed because she fell asleep on the couch after school. I was unabashedly relieved at this sight. I breathed easier. And yes, my husband will be taking her out next. It is a frightening experience, getting into the car with your child. Handing over the keys and the control are not easy tasks. Having been a driver for more than 25 years now (really, gulp?) I tend to forget the “legal” and “proper” ways to actually drive the car. How many seconds are you supposed to follow? You mean I can’t kiss their bumper if they are irritating me? Come to a complete stop at a stop sign? Not roll, look both ways and then proceed? Along with trying NOT to be so nervous and uptight, we now have to re-learn all the real rules of the road that we have long forgotten. Rules of the Road DVD: this was an extremely helpful refresher for me and a great beginner’s guide for your teen driver. From passing the written test to basic car maintenance this DVD set has you covered. Included in the DVD set are interactive quizzes and practice exams. From Bumper to Bumper by Bob Sikorsky: “a special collection of Sikorsky’s most talked about columns, covering everything from car repair rip-off schemes and environmental awareness to auto industry trends and techniques for better gas mileage”(221). This book is filled with handy tips such as : Everything you need to know about gasoline, earth- friendly driving and breaking your new car in right. Traffic by Tom Vanderbilt : Traffic gets under the hood of everyday activity of driving to uncover the surprisingly complex web of how traffic works, why we drive the way we do and what our driving says about us. Traffic is a fun book with great chapters such as Shut Up, I Can’t Hear You: Anonymity, Aggression, and the Problems of Communicating While Driving. My favorite is How’s My Driving? How the Hell Should I Know? The Book of Expert Driving by E.D. Fales, Jr: The finer points of car handling for both the experienced and student driver. Expert Driving was written almost entirely on the road not by someone sitting at a desk. This book goes beyond the driver education and onto the real enjoyment of driving. In the Driver’s Seat : a girl’s guide to her first car by Erika Stadler : A new car for my daughter is a long way off in my house but this is a good book for her to read. Stadler guides the reader through everything from the owner’s manual to “styling” your ride. Every girl should know how to “pop” the hood! I actually read this book to brush up on my own car knowledge. Provides useful information for driving and owning an automobile, including how to buy and insure a car, solutions to minor problems, learning what’s under the hood, how to choose a mechanic, and surviving emergency situations. Another fun book is Car Smarts: Hot Tips for the Car Crazy written by Lemon-Aid car guide,Phil Edmonston , award-winning librarian Maureen Sawa and illustrated by award winner Gorden Suave. From labeled diagrams of mechanical systems to famous designs and tips on buying and maintaining your first car, this book has it all. This post is authored by Audra, who is very grateful to her husband for taking over the lessons…. We are embarking on the journey of college hunting and financial aid mayhem with our daughter. It truly is a long and winding road down the abyss of the unknown. I find myself having the same thoughts as when she was born, now what? My husband and I are extremely lucky in the sense that she is a driven and conscientious student (Both of our daughters are). The expectations and responsibilities can be overwhelming. As sophomore year ended, the questions had already started. What colleges are we looking at? Did you visit any schools this summer? What is she going to study? Things certainly have changed since I was in school; the push is harder and the pressure much heavier! The library is a wonderful resource to help us navigate through this stressful but exciting journey. I found comfort and guidance in browsing the stacks and our catalog. There are also some fabulous websites to assist a student and parents through the maze of selecting the right university. CollegeBoard.com and Princeton Review are great sites to browse and evalute the colleges. The sites allow the students to refine their searches by the size of the college, rural or suburban and by fields of study. I created an account on CollegeBoard.com to save our college searches and we can also set reminders for SAT and ACT test dates. We can even access her scores. If you do not like to do your research online, the OWL has plenty of print resources to guide you through these many steps and to hopefully make your next huge step with your child easier! Princeton’s Complete Book of Colleges, Princeton’s Best Northeastern Colleges and Princeton’s Best 371 Colleges : These mega-guides of Colleges and Universities are good resources for the top colleges and are very easy to use. Princeton rates the colleges by level of financial aid, academics and eco-friendliness. Find out about the costs, admission requirements, student demographics, campus activities and the schools’ facilities in a very user-friendly format. College Board Book of Majors: I loved this book! It is a great book to take home and leave on your kitchen table for your student to peruse through at their leisure. If the student knows what he or she likes to study, the book provides a nice layout for course studies,available majors and best of all, the career options and trends. If your child needs a little direction, the College Board Book of Majors is the book to check out! Barron’s SAT guide will give your student the edge and the study help to score better on the test. The study guide helps the student prepare by giving them testing tips and it provides multiple practice tests. Peterson’s Four Year Colleges: This giant 2010 edition contains the latest facts and figures on tuition expenses and academic programs for over 2500 colleges in the United States, Canada and abroad. Students can match majors to colleges and investigate entrance qualifications. Peterson’s Two Year Colleges: Nearly 2000 colleges across the United States are provided in this comparison guide. Readers will gain valuable tips on transfering and ways to pay for your college education. Search by school name, location or major, very easy to use! Financial Aid 101 by Carlyn Foshee Chatfield and CollegeBoard’s Getting Financial Aid provide comprehensive advice on how to pay for college and how to navigate through the financial aid process. Wondering how in the world are you going to pay for your child’s education? These books offer advice on scholarships, grants and loans. Also another interesting option is the New England Board of Higher Education: NEHBHE’s Tuition break for New England Residents provides a discounted out- of -state tuition rate to eligible students enrolled in approved majors at state colleges and Universities in Connecticut, Maine, Massachusetts, New Hampshire, Rhode Island and Vermont. Visit www.nehbe.org/tuitionbreak to learn more and to see the list of approved programs. This post is written by Audra MacLaren, proud mom who is trying to navigate through the piles of college information! This week I am away from the library on vacation. As I have written in one of my recent blogs, we are new homeowners. It is my first full week off in the new house and I am looking forward to it. Over the past ten months we have discovered a plethora of quick fixes that the previous homeowner completed so that the house would “look good” for the realtor showings. For example,the toilet paper holder fell off the wall two days after we moved in. The darn thing was totally cosmetic and barely hanging by the screws.The other night I went into the bathroom to retrieve some dental floss out of the cabinet and the entire cabinet came crashing down.I am glad I was the one who had the unfortunate accident and not my kids! The fix- it list so far in the bathroom is: fill the large holes in the wall, sand and paint the wall then hang a new cabinet. The book, Creative Homeowner’s Bathrooms, is just what I need to handle these repairs.I can plan, remodel and build all sorts of bathroom projects. The book’s introduction is filled with tips on the basics. It is a great beginner’s guide. Chapter 6 is just what I need to fix the bathroom: Vanities and Storage. Chapter 12 is packed with Paint and Fixtures Guidance. My dream chapter would be 15: Master Baths, the Luxurious Personal Haven. Onto the next room or shall I say rooms, our entire house was painted in cream. Everything is cream-colored, the trim, baseboards, window sills and the walls. I am ready for some color and some touch ups. My eyes cannot take the sea of cream anymore. As you readers know, my husband is quite talented with paint. He has an amazing eye for color. I have brought home the 1001 Ideas for Color and Paint by Emma Callery. Color and decorating is not my thing but I do know that I do not like all of this beige. The book has great color palette groups for you to choose. It displays nice layouts for the reader to see what colors will compliment each other or better yet, the book also describes the colors by multiple schemes. For example: harmonizing schemes or maybe you like contrasting schemes. I like the ideas the book lays out for painting by the decades. Geoff and I both like the 70’s, the avocados and golds. The Popular Mechanics Complete Home How-To is going to assist us with the minor fixes we have to do with the walls and moldings. We also need to address some of the flooring issues in a few of the rooms. The Popular Mechanics Complete Home How-To is printed out so nicely with step by step instructions and photos. I am trying to ignore the chapter on infestation and mold. I really hope our inspector did not miss anything there! Perhaps I should read it just in case. The grossest thing we encountered by far was the carpeting in the kitchen and laundry room.I found myself thinking, what if I dropped an egg? Or what if the washing machine overflowed? We immediately pulled the rug up when we moved in and yes, the rug was pretty gross. The floors underneath the rugs are pretty bad. Old laminate flooring was unearthed.The floors are covered with scratches and some holes but this to me is better than the carpet! Ahh to dream of tiled kitchen flooring, nice clean lines without holes or scratches. A floor that actually looks clean after you wash it! Sunset Tiling by Josh Garskof is going to fulfill me in the home improvement daydream department. It is all about tiling from floors, back splashes and countertops. It also shows you how to tile the bathroom and shower. Tile comes in so many beautiful shapes, textures and sizes. This book is a lot of fun to browse. I have taken home two books that are nothing but pure dreaming right now because we have too many basic repairs to be done but a girl can dream, can’t she? The two books are The Stone Primer by Charles McRaven and The Sourcebook of Decorative Stone by Monica T. Price. The Stone Primer is great book with beautiful and bold plans for your outdoor living areas. It contains nice pictorials for stone walkways, patios and walls. The projects for backyard accents and waterways are very interesting. The craftsmanship in the Stone Primer was inspiring. I think I will leave the yard designs up to Geoff though. I guess I better get to work! Just finished up looking at Handy Ma’am by Beverly DeJulio,the do it yourself book for moms and families. I am armed with my tool belt ready to rock and roll. But really, I am in the mood to watch The Money Pit with Tom Hanks and Shelley Long. This movie is absolutely hysterical. The best part of the movie is when Tom Hank’s character falls through the floor and gets stuck. His fall is the last straw of his sanity and he begins to laugh hysterically. I don’t want to jinx myself but the movie is very funny as one thing after another happens to these new homeowners. This post is written by Audra– who probably will have her nose in a book all vacation instead of using my tools :0)…hey isn’t that what a husband is for?? For the past few years, my husband has done the extraordinary summer reading posters for the OWL. I love seeing his work hanging on the big windows and watching the children happily placing their stickers on them. However, living with a creative soul is quite the rollercoaster ride. Geoff has stalked around for three weeks with a dark cloud over his head while creating these works. You could just see his mind churning as the frustration mounted. He would trudge off to the shed with his mind a million miles away. Geoff is a perfectionist with his art; he has a vision and it must be accomplished. My husband becomes consumed with his creation and he is very distracted. As I bid him off to work, I can see speckles of blue paint on his ears– he scratches his head quite a bit when he paints. As he departs, I can also see that his elbows are covered with yellow paint. To make matters worse, while he was painting he wore his only decent pair of shorts; now they too are speckled with paint as are his shoes and t-shirts. (Hence why he only had one pair of shorts) One evening while preparing dinner, I noticed we were running out of dishes. Where are my dishes? I took a gander out in the shed. Guess what? There were my new dishes that I received as a Christmas gift. They were covered with gobs of wet paint. Geoff was using them as his paint palates. What is a wife to do? Edward Hopper Modern Master by Ita G Berkow and Edward Hopper by Carol Troyen: I love the way Hopper captures the isolation of the individual of the changing America. He captures the realism of American everyday life. I enjoy his works that encompass the cityscapes and middle class American homes the most. Vincent Van Gogh text by Meyer Schapiro: The intensity of Van Gogh’s work, his color sense and his emotional expression has influenced many of the greatest artists. His numerous self-portraits, bright sunflowers, and the swirling blues of the sky, are wonderful pieces. George Tooker text by Robert Cozzolino: I am not sure why I like George Tooker because most of his works are dismal and quite disturbing. However, I am drawn to his use of color and the way he captures the dreariness and banality of life. 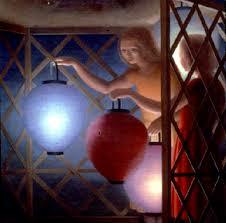 Painting with egg tempera, Tooker almost creates a soft glowing effect in his pictures. Andrew Wyeth introduction by David McCord and Andrew Wyeth: The Helga Pictures with text by John Wilmerding: Andrew Wyeth captured American landscapes and lives over a 70 year period. Wyeth paints mostly New England backdrops and a handful of unconventional models. His images often display a deep emotional isolation. Jack Vettriano text by Anthony Quinn: A self-taught painter and Scotsman, Vettriano creates very bold and romantic pieces. He is often rejected because of his lack of education but he is clearly one of best known painters of Scotland. We all have our guilty pleasures with reading (or at least I admit that I do). Lee Child’s Jack Reacher series is mine! I have been saving Lee Child’s novel Gone Tomorrow for my summer reading and now I can add one more book to my list, his newest book 61 Hours! I am unabashedly in love with Jack Reacher. This is by far one of the best recommended reads that I have received from my fellow patrons. Lee Child has a strong legion of fans– both men and women alike love the ex- military policeman drifting along the country saving strangers. These thrillers are not for the faint hearted; they are filled with action, violence and mystery. Buckle up for a thrill ride with Mr. Jack Reacher! Killing Floor: This is your introduction into the world of Jack, the ex-military policeman passing through Margrave, Georgia. He has been arrested for murder which we know couldn’t possibly be true. Jack must clear his name and find the real killers. Die Trying: Jack once again finds himself at the wrong place in the wrong time only this time he is wandering around Chicago. Reacher gets abducted in broad daylight along with a woman– together they must escape from a wilderness prison. If anyone can save them, Jack can! Tripwire: Reacher’s lazy anonymity in Key West is shattered by a stranger who comes to town searching for him but ends up dead. Following the man’s trail back to New York, he finds an elderly couple still mourning a son lost in Vietnam, a woman Reacher can’t forget, and a most vicious opponent. Running Blind: A clever killer is murdering women and there is one connection between all of them- Jack Reacher. Echo Burning: We find Jack hitching rides across the hot state of Texas. The big man is having a hard time finding a ride. His luck changes when a beautiful woman picks him up in an air-conditioned caddy. Of course, she is just another damsel in distress waiting for Reacher to save her. Can he save her from her monster husband and his family? What do you think? Without Fail: The Secret Service is calling Reacher. Can he help them protect the Vice President? Only Jack has the head and the heart to corner the bad guys and bring them to justice. Persuader: Unfinished business has found Jack and he is a man who must finish his business. Someone got away with murder ten years ago and now Jack has found him…. and he is ready to tie up some loose ends. The Enemy: Renegade Jack has been ordered to “control the situation” at hand when a two-star general is murdered in a seedy motel in North Carolina. One Shot: In the book’s gripping opening, five people are killed when a shooter opens fire in a small unnamed Indiana city. When the sniper is apprehended, he refuses to talk, saying only, “Get Jack Reacher for me.” But Reacher’s already on his way. The sniper has done this before, and Jack has had enough. The Hard Way: Hot New York City is the setting for this thriller. Reacher is hired to hunt down a family that has been kidnapped. On the trail of the vicious kidnapper, Jack discovers his employer has many dangerous secrets and he is in way too deep to get out. Bad Luck and Trouble: This novel leads us to the lights of Vegas and the evils of international terror. Jack unites with some of his old army unit buddies to investigate a brutal murder of man they all knew. Nothing to Lose: Reacher ends up in the middle of a battle between two towns, aptly named Hope and Despair. One town wants his help and the other wants Reacher gone. 61 Hours: It is winter in South Dakota. Blinding snow and an icy highway cause a bus crash. Good thing Jack is on the bus, because something nastier than the weather is on its way…..
Worth Dying For Due to come out September 30th 2010. Makes a nice “bookend” to my summer reading with Jack Reacher. Get your name on our reserve list now! This post was authored by Audra who is counting the days til school is over and summer begins! There we sat, 8th graders in English class with Sister Joan. She was the quintessential teacher– tall, thin, bespectacled and very stern. Poetry was our lesson at hand. She had our homework assignment written in big, looping, chalky letters on the blackboard: memorize the William Wordsworth poem, I Wandered Lonely as a Cloud. I thought no problem, I love this poem. I knew it already, piece of cake. Then… my world was shattered. Sister Joan proceeded to announce that we must be able to SING this poem SOLO. She will go up and down the aisles randomly, and you must sing the poem to her. The poem was to be sung to the same tune of “Riders on the Storm”. I am thinking– what?? The Doors?? How on earth does she know this song? We all groaned and looked at each other nervously. Oh goodness, I thought– How on earth was I going to do this? A sleepless night ahead for sure. The following day, English class bell rang (which by the way was a very large, old-fashioned hand bell they rang in the hallway). There we sat, again strictly instructed to sit eyes forward, back straight, feet neatly aligned under your desk and hands folded on top of your desk. Time for uniform inspection; I was all set– crisp, white peter pan collared shirt, neatly ironed plaid skirt with vest and my navy blue knee socks pulled up and perfectly evenly matched. To torture us even more– she walked up and down the aisle with a wooden ruler in hand inspecting us from head to toe. The mighty ruler slapped the desk loudly with the beat of the song. “I cannot hear you!” she growled at me. “Louder!” she screamed at me, whap! whap! whap! with impatience she slammed the ruler on my desk. That was it. I was done, beyond done. I finally blurted out, “I don’t know it; I did not do my homework last night.” She glared at me and cracked that wooden ruler one more time and demanded that I write the poem fifty times as my punishment. She told me that I better be ready to recite the poem tomorrow. I thought, game on Sister. This was it for me– Go Time. I am NOT going to do this again. I will take that “F” and anything else she can dish out! This was just the beginning for me and my battles of solo recitations. I am not sure why it became such a requirement with poetry in school, but I spent many free periods inside and many nights writing out poems in repetition. Thankfully my fear of public speaking and the punishments did not deter my love of poetry. I guess my stubbornness would not allow them to muddy my enjoyment. Quite the contrary– I wanted to guard the words and their meaning from the senseless memorization! You should feel the lines and the expressions. Poetry is awesome. You can crack open any collection, read one short stanza and ruminate about it for hours. Celebrate poetry with me! Come into the OWL and grab a book, or click on my links below to read one…….. This post is authored by Audra –who still digs the Doors and is humming People are Strange….